Following the recent discovery that SimCity can function without an internet connection, Maxis general manager Lucy Bradshaw admits that they could have created an offline mode for the game. At this point, SimCity is less a game and more an ongoing controversy. We recently reported on the efforts of a modder who managed to turn off the game's online requirements with little trouble, disproving EA's assertion that the game simply doesn't function without a connection to the 'net. In light of this revelation, developer Maxis has admitted that it could have created an offline, singleplayer mode for the title, but couches this admission with the caveat that such a feature would have compromised the firm's vision for SimCity. In a newly-published entry on the official EA blog, Maxis general manager Lucy Bradshaw attempts to offer blunt honesty on the situation. "... could we have built a subset offline mode? Yes," Bradshaw states in no uncertain terms. "But we rejected that idea because it didn't fit with our vision." "We did not focus on the 'single city in isolation' that we have delivered in past [SimCity games]. We recognize that there are fans -- people who love the original SimCity -- who want that. But we're also hearing from thousands of people who are playing across regions, trading, communicating and loving the Always-Connected functionality." "The SimCity we delivered captures the magic of its heritage but catches up with ever-improving technology," Bradshaw adds. Describing SimCity as akin to an MMO, Bradshaw also illustrates a number of reasons why key aspects of the game's core functionality rely on the presence of an online connection. "Always-Connected is a big change from [SimCity games] of the past," Bradshaw writes. "It didn't come down as an order from corporate and it isn't a clandestine strategy to control players. It's fundamental to the vision we had for this SimCity." "From the ground up, we designed this game with multiplayer in mind -- using new technology to realize a vision of players connected in regions to create a SimCity that captured the dynamism of the world we live in; a global, ever-changing, social world," she adds. 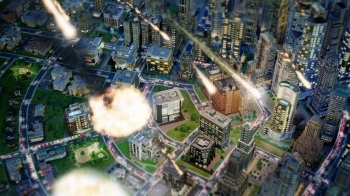 It's not our place to question Maxis' artistic vision, though the issues experienced by many players immediately following SimCity's debut serve as ample evidence that perhaps the lack of an inherent offline mode wasn't the best decision the developer could have made when creating the title. On the other hand, as Bradshaw points out, the Always-Connected scheme does allow the game to keep constant, ever-updated saves on an off-site, cloud-based server. That's undeniably convenient. In the end, the question is how many of you would have traded this convenience and the game's multiplayer functionality for a title that simply worked, straight out of the box. If internet furor is anything to go by, we'd guess most of you would opt for the latter.